International Color Time comes to Android! What happened to that helmet? This week at Poetry Central Headquarters: "What's Mine Is Ours"
2012 was the year of efficiency for the Solar System Perspective Project, with three distinct setup teams. Pat and Anna got up before anyone else and went out to mount Saturn, Uranus, and Neptune. It's only three planets, but it's two-thirds of the distance. 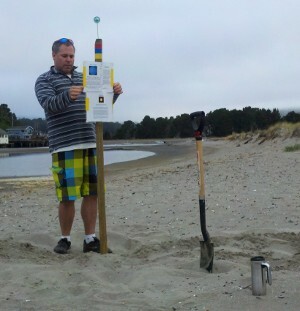 Note that we remembered the shovel this year, AND there was a travel mug full of coffee. Uranus and Neptune were both new, having been broken off the stakes by persons unknown during the last exhibition. This is my favorite shot from the setup. Planethead! Eventually, the rest of us awoke. Craig and Christina were the sun team. Craig put the structure together while Christina hand-sewed a few gaps in the gold lame cover (finding a needle and thread was one of the morning adventures). 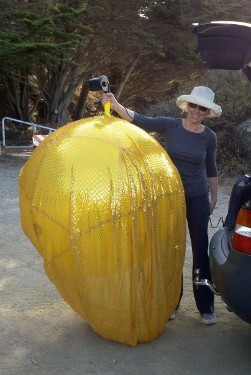 Here's Christina inflating the sun with an excellent car-powered air pump that we should always use. 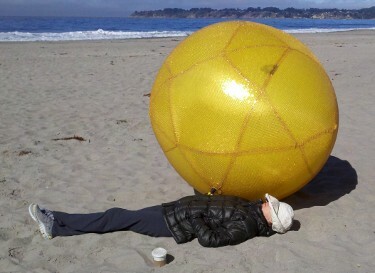 Then she took a bit of a rest. 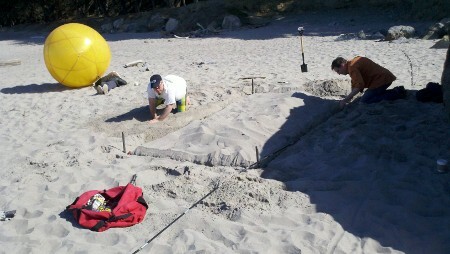 Pat returned from the outer reaches of the solar system in time to help bury the sun structure. 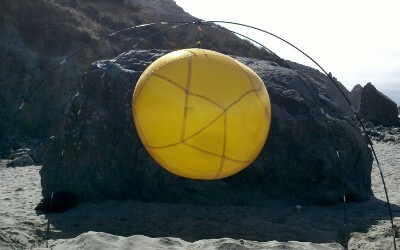 This is actually a new support structure for the sun. The old one was left under Syd and Gina's house in 2009, and they unfortunately don't live there anymore. The sun hangs a bit lower now, but no one seems to mind. 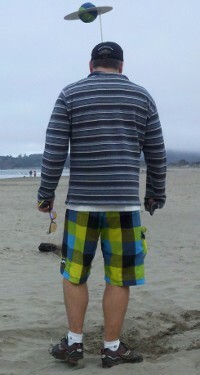 You can still see it from far away unless the beach is extra crowded. Meanwhile, the third team (me - is there an "I" in "team" if the team only has one person?) put up the remaining planets and other signage from Mercury to Jupiter. 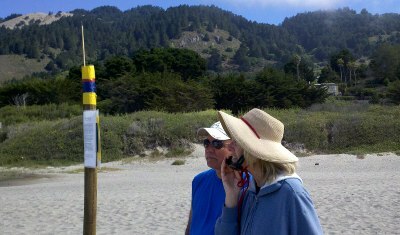 Here are a couple of people checking out the last one (Ceres) just after it went in at about 11:15am. 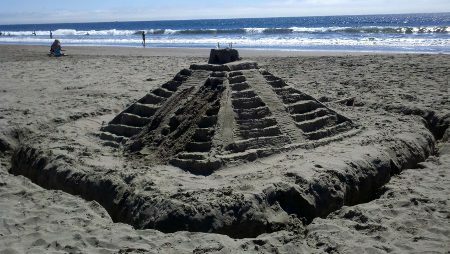 Somebody made an awesome ziggurat nearby. By Sunday, the ziggurat had vanished. 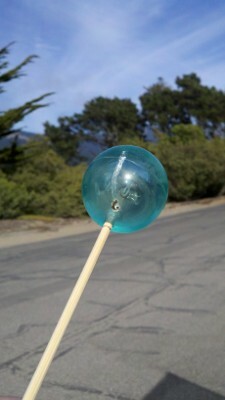 So had Uranus, yet again (just the ball, not the stake), removed by person or persons unknown. Mars cracked in half, likely as a result of being an eight-year-old allspice berry rather than by any deliberate vandalism. And Neptune suffered a slight indignity at the hands (OK, not the hands) of a bird (pictured at right). Cleaning and replacement will begin shortly, or just before the next time we mount the project, whichever is the path of least resistance. Other aftermath: Craig had a wicked sunburn. Be sure to put on some sunblock before you come out for this! All in all, it was another rousing success for the Solar System Perspective Project. Thanks once again to everybody who came down for it or stumbled across it accidentally and told us what they thought.